A ten pack of mono and bilayer graphene on 1cm x 1cm silicon wafers (p-doped) with a 285 nanometer silicon dioxide coating. 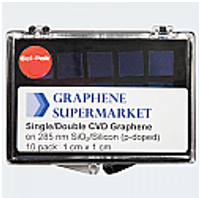 The samples have nearly full monolayer coverage with 10-30% coverage of bilayer graphene islands. They are a great low-cost alternative to monolayer graphene for select purposes.